GALLIPOLIS — An American Electric Power representative met with Gallipolis City Commissioners Tuesday evening to discuss decreases in power costs across city limits. Power companies had previously been bidding for power contracts with city limits over the past several weeks and AEP was ultimately chosen as the winner by city officials. According to Bailey, if one assumes a facility’s useage of around 12,000 kilowatt hours per year, it’s going to save the bill payer an excess of $250 a year. The rate price will reportedly continue for three years before being subject to change. Bailey said the city and AEP will also take part in other sponsorships across time. According to City Manager Gene Greene, the city had previously had a power cost of around 7.2 cents per kilowatt hour which would be dropping to 5.1 cents per kilowatt hour with the new deal. Given city government building rates, Bailey estimated the city would save around $36,000 a year in power costs. According to city officials, letters bearing symbols from the city and AEP should be reaching residents within a few days detailing the nature of the power agreement. If residents would like to opt out of the program, they may contact city officials to do so. If they wish to stay in the program, they need not reply or contact officials. Those who may be served by other power interests can opt into the program given they are within the program’s geographic reach. American Electric Power Aggregation Program Supervisor Chris Bailey speaks before Gallipolis City Commission about drops in power price for city residents. 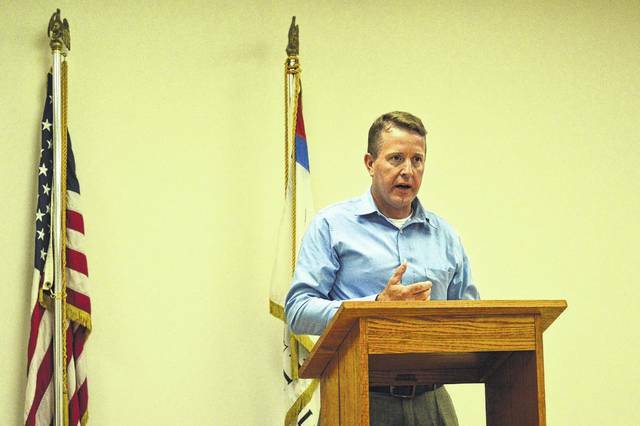 https://www.mydailytribune.com/wp-content/uploads/sites/42/2017/08/web1_DSC_0394.jpgAmerican Electric Power Aggregation Program Supervisor Chris Bailey speaks before Gallipolis City Commission about drops in power price for city residents.